Dawn, Dusk, Noon, and Midnight Dragon Stalkers Roam in the Land of Zandador. Ready to escape earth and travel to a different dimension, one where dragons exist and people live for hundreds of years? Then pick up this book and enter the Land of Zandador, part of the dimension God created after the flood to preserve the animals who wouldn’t be able to survive earth’s post-flood atmosphere. 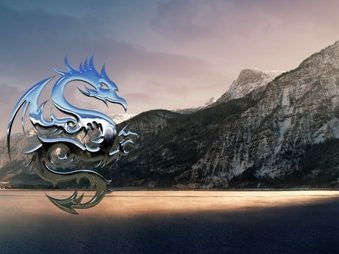 Dawn, Dusk, Noon, and Midnight Dragon Stalkers roam the land, and the loyalty of the dragons lies with the humans who control them: Collectors, Hunters, Protectors, or Destroyers. These four factions are the Dragon Stalker Bloodlines. This book begins the Saga of the Bloodline Heroes. Javan is one of those heroes from the Collector Bloodline. But having grown up on earth, the ordinary, lanky teenage boy knows nothing of his heritage, and his biggest dream in life is to impress a girl by playing football. Until he is whisked away to the Land of Zandador. Here he is no ordinary boy. Here the fate of a nation and all dragons rest on his shoulders. Here he must learn how to ride Dragon Stalkers and unite the four Bloodlines in order to overthrow the Dark King, free the people of Zandador, and save the Dragon Stalkers from extinction. 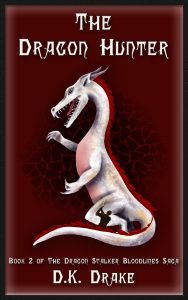 The Dragon Collector’s quest begins when he learns of his heritage and must quickly gain the skills he needs to collect his first dragon…or his long-lost mother is doomed to die at the hand of the Dark King in the Land of Zandador. 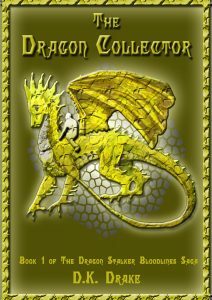 In the Dragon Stalker Bloodlines Saga, Javan, a lanky teenage boy from the Collector Bloodline, is on a mission. He must collect all four types of Dragon Stalkers and unite the four Bloodlines in order to overthrow the Dark King, free the people of Zandador and save the Dragon Stalkers from extinction. Micah, a strong soldier from the Hunter Bloodline and son of the Dark King, is on a mission to stop Javan by hunting the four types of Dragon Stalkers before Javan can complete his collection. The Battle for the Throne began in book one of the Saga. Micah captured Mertzer, a Dusk Stalker; Javan collected Varjiek, a Noon Stalker. The battle continues in book two, The Dragon Hunter. Micah is one of the youngest men to ever enter the Battle for the Throne, and he proudly fights to keep his father, King Omri, in power. But when he is transported to unfamiliar territory with his rival Javan, his fight becomes one of survival and can only end when he wins another dragon or loses his life. 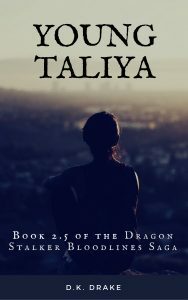 Taliya is a Dragon Protector who makes her first appearance at the age of twenty-two in The Dragon Hunter, book two of The Dragon Stalker Bloodlines Saga. But how did a Protector from the Land of Zandador end up in Keckrick hiding a Dawn Stalker? Why does she live alone? In a treehouse? Far away from any other people or villages? How did she become known as a Healer? Where did she get all of her books? Why is a slingshot her weapon of choice? Those questions and more are answered in this novella that begins with a four-year-old talkative Taliya and ends with a few scenes told from her perspective when she makes her first official appearance in chapter seventeen of The Dragon Hunter. Enjoy this quick read that is as short and sassy as the character herself.